It is almost two months since my dearest friend and guide Moiya passed away after the Ramazan festival and I still cannot believe that he has left us and gone to His Almighty leaving me and his closest friends, especially Maxi, Rohan and Nimal, not forgetting Daya Pelpola, presently Ambassador, Rome. I cannot forget the Annual Voetlight Dinner organised by the Voetlight Society exclusively for lawyers where I always organised the table for 10 of us headed by none other than Daya Pelpola the most senior member of the 10 including Nuala, Nalini my wife, Mano and Sudath Jayasundara. Every year I pick up Moiya for the event and safely drop him back at his residence. It was full of fun which I feel will never be enjoyed again. I cannot forget the days when he calls me to pick him up to go to Hulftsdorp when his driver is on leave and he requests me in advance to pick him up but at 8:30 only when he is ready. On the way he would request me to switch on the radio of my car to listen to the golden oldies. He was very keen to listen to the songs of Jim Reeves and Elvis Presley whom he could imitate to the core. I have had the opportunity of listening to him at the Oaths party of his and his batch mates of the group of 67 at Law College in addition to the Sinhala baila songs which I will say without any hesitation that nobody can sing like him and it was a request for more and more of his songs whether it be Sinhala or English. Moiya was one year senior to me but we both associated like friends till his demise. I have retained him as counsel in cases in the District Court, Civil Appellate Court and Supreme Court not forgetting the famous case against the Finance and Guarantee Ltd. and Golden Key Ltd. He commanded a good rapport with the judges who also respected his honesty, legal prowess and his seniority at the bar. He functioned as the Treasurer of the BASL for the three consecutive years and was elected uncontested. He never failed to attend the Bar Council Meetings held on Saturdays of the end of each and every month of the year and I am bound to take him for the meetings and no sooner he gets down from the vehicle he makes a quick dash to the second floor of the BASL building to enjoy the kiribath and katta sambol which he really loved and cherished. 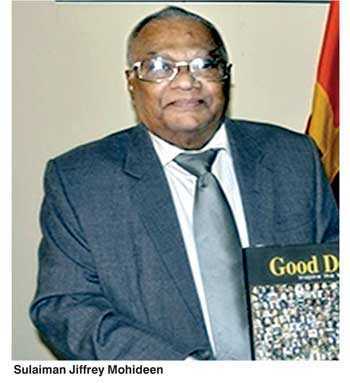 I too enjoyed his company every time I accompanied him for the meetings as well as every function organised by Colombo Law Society of which I was an Executive Committee Member and BASL. It is with a heavy heart I say that I am missing his companionship at this moment when I go for the Bar Council Meeting all by myself. When it was confirmed that he was to be appointed as Ambassador to UAE, he called me and asked me to drop in at home since he wanted to give his NLRs and CLEs to my son Dhanushan, who is practising as a counsel and when my son took oaths as an Attorney-at-Law, he was present in the Supreme Court ceremonial hall to witness the oaths ceremony and was the first to wish him. Even after his appointment as the High Commissioner to UAE, he was in constant touch with me regularly at least once a week and when I do not hear from him I called him to inquire about him and his work. Just one week before his departure from Dubai when I called him he just casually told me that he knocked his toe against the staircase railing and he was going to the doctor but I did not know that it was for his terminal illness till I visited him at his home after hearing that he has come back to Sri Lanka for treatment as a shocking news from none other than his dearest wife Neloufer. When I heard the news I could not believe my ears and could only pray to God to save him from his deadly illness but it was a matter of time. Anyhow I was happy that I spent considerable time with him lying on his sofa holding my hand having a long chat till I departed from his home after having a meal when the family broke fast during the Ramazan period. After the Ramazan festival on Saturday afternoon I got a frantic call from his daughter late in the evening that her dad has passed away. Till Moiya’s departure to UAE, as Ambassador, every year on the Ramazan day he called me in the morning and warned my wife not to cook lunch and just before lunch time he personally drops in at home to deliver the sumptuous biryani lunch which we really enjoyed and thanking Moiya for same. My family conveys our deepest sympathies and sorrows to his beloved wife Neloufer and his children at this hour of grief. Moiya, though you have left us your memories will linger in eternity and when I see the table where we sit and jabber at the lounge at Hulftsdorp I feel the vacuum which you have left and gone and I say my sweet Prince till we meet again.